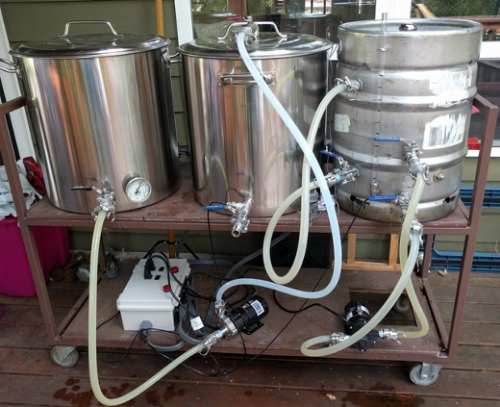 While the rest of us are forced to leave the house to obtain a tasty brew, beer master Christoper Aedo has incorporated a Raspberry Pi into his home brewing system for ultimate ‘sit-back-and-relax’ home-brew home brew. Before I could talk myself out of the project, I decided to start buying parts. My basic design was a Hot Liquor Tank (HLT) and boil kettle with 5500W heating elements in them, plus a mash tun with a false bottom. I would use a pump to recirculate the mash through a 50 foot stainless coil in the HLT (a “heat exchanger recirculating mash system”, known as HERMS). I would need a second pump to circulate the water in the HLT, and to help with transferring water to the mash tun. All of the electrical components would be controlled with a Raspberry Pi. First, he set up the electrical side of his home-brew system using The Electric Brewing Company‘s walkthrough, swapping out the 12V solid-state relays for ones that manage the 3V needed by the Pi. Aedo then implemented the temperature sensors and controls of these relays. 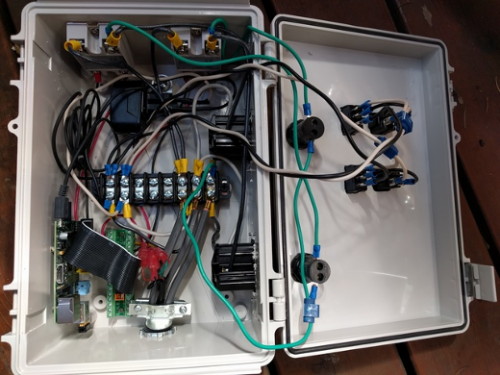 He used Hilitchi DS18B20 Waterproof Temperature Sensors connected to a 1-Wire bus and learned how to manage the relays in this tutorial. Christopher wanted to be able to move his system around his property. Therefore, he squeezed all the electrical components of the build into a waterproof project box. For cooling purposes, he integrated copper shims and heat sinks. Among the wires, wires, and more wires sits a Raspberry Pi, bottom left. With the hardware sorted, he took on the project’s software next. Although he had been inspired by it, Christopher decided to move away from the StrangeBrew Elsinore project in favour of the Python-based CraftBeerPi by active repo maintainer Manuel Fritsch. This package allowed him to configure his chosen GPIO pins and set up the appropriate sensors. In fact, the setup process was so easy that Christoper also implemented a secondhand fridge as a fermentation chamber. In his recently released article on opensource.com, Aedo goes into far more detail. So if you want to create your own brewing kit, it offers all the info you need to get going. Christoper attributes a lot of his build to the Hosehead, Electric Brewery, and CraftBeerPi projects. 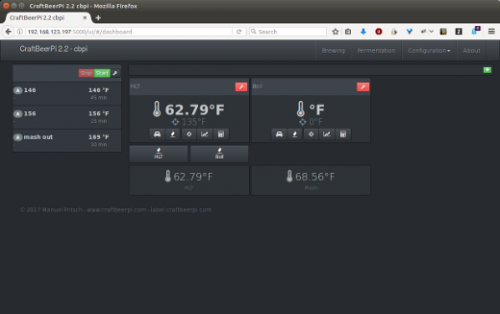 Using their resources and those of StrangeBrew Elsinore, any home brewer can control at least part of their system via a Raspberry Pi. Moreover, they can also keep track of their brewery stock levels via the wonderfully named Kegerface display. We love seeing projects like this that take inspiration from others and build on them. We also love beer. How about you? Have you created any sort of beer brewing system, from scratch or with the help of an existing project? Then make sure to share it with us in the comments below. *Did you know the British pint is larger than the American pint? The British pint is 20 oz., the U.S. pint is 16 oz. This was Tom Jeffeson’s idea. He thought it made more sense to have 1 pint = 1/2 a quart. In George Orwell’s 1984, the protagonist meets an old man in a pub who complains about the metric system. He says that 1/2 a liter of beer is too little, and a liter is too much, and he misses beer by the pint. This is baffling to an American audience. The British pint is 20 fluid ounces, but the Americans use a different sized fluid ounce for their 16 to the pint. So… why is a liter too much ? The internet of beer using a pi. Only German beer is real beer! Amazing work. I was never think of PI’s ability to this extent. Really bright future. Waiting for more projects like this. That’s great. As a home brewer, i like this project. Nice pumps as wel….. magnet pumps i guess …. where did he get those ? It’s not just the non-imperial, non-metric quantity units that spoil this project. It’s the non-standard temperature scale. Why do the Leftpondians (not their northern or southern partners) continue to use Fahrenheit for temperature? Canada, Mexico and most of the rest of the World use Celsius’ much more scientific scale. The beauty of computers is that you can use any units you want. As for the dimensions of the parts, they need to be adapted to locally available sizes. The real bugbear is of course the language used in the description: there are many more logical languages than English.